Resonance was studied in the context of watchmaking as early as the 17th century, when Christiaan Huygens (1629-1695), inventor of the pendulum clock, first discovered that two separate pendulum clocks, when hung from a common beam, synchronized, thanks to resonance (two oscillating bodies in close proximity influence each other and eventually synchronize). Abraham-Louis Breguet later also explored resonance and subsequently created a double pendulum resonance clock. 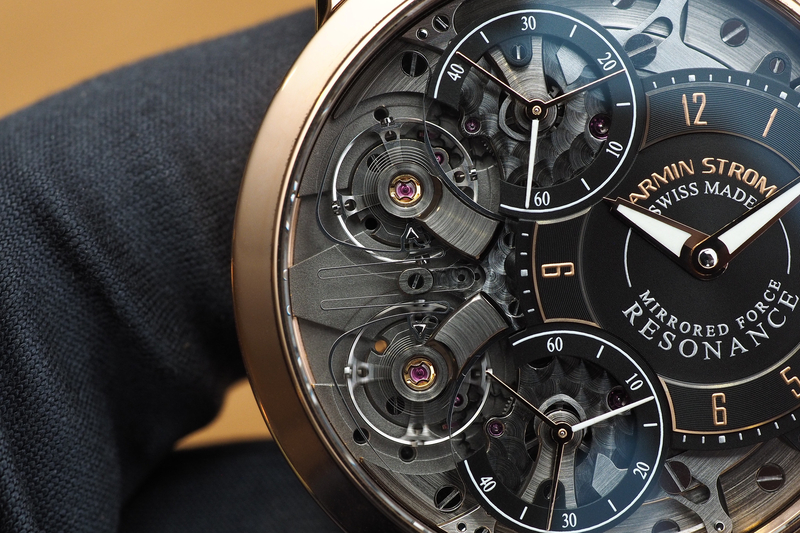 According to Armin Strom, there are three main benefits of resonance. First, it creates a stabilizing effect on timekeeping which improves accuracy. Second, it conserves energy. Third, it reduces the negative effects of timekeeping accuracy due to outside disturbances, such as shock to the balance staff, which stabilize the rate and increases precision. Ultimately, both balances will strive to get back in resonance, thereby averaging and minimizing the effects of the outside influence as they find their rhythm. 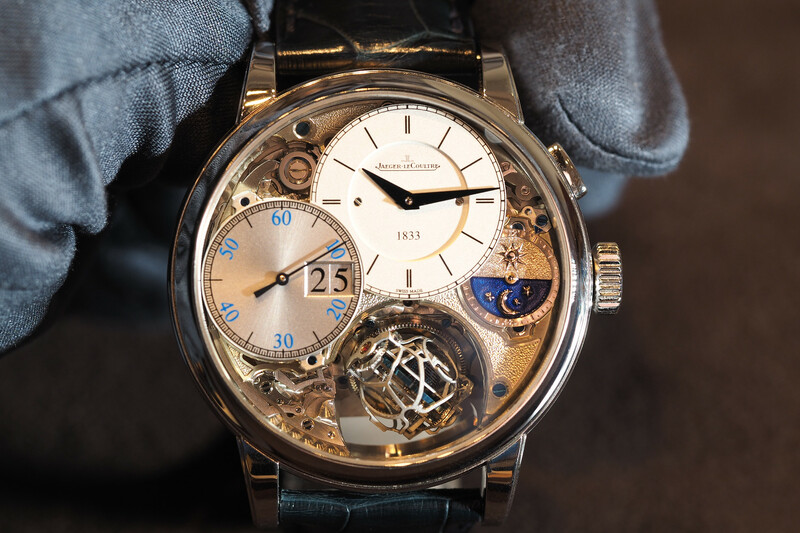 In order to achieve what Armin Strom refers to as Mirrored Force Resonance a clutch resonance spring, which is visible at 9 o’clock, needed to be created in-house to connect the two regulation systems together. Made of steel, the spring took two and half years to perfect. 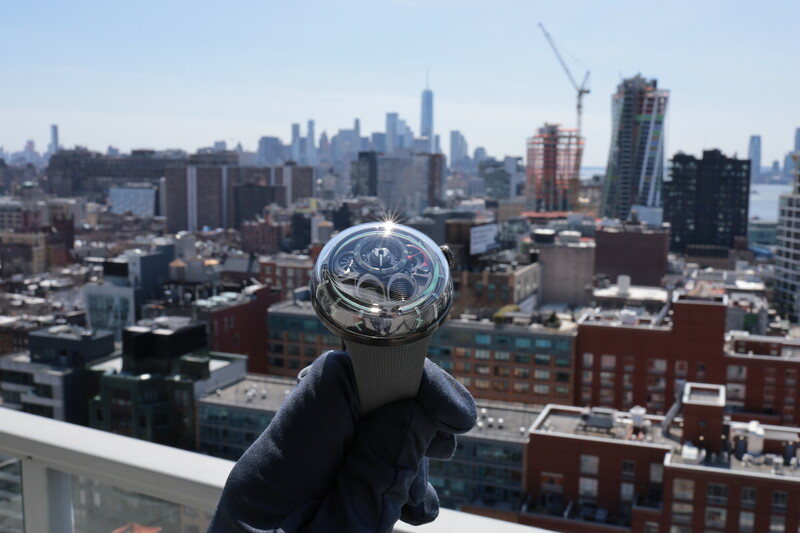 The result is a direct connection between the two independent “mirrored” balance wheels and balance springs, that are visible on the left side of the dial (the connection is via the balance spring studs, which receive the impulses from one another via the clutch resonance spring). Interestingly, the two connected oscillators revolve in opposite directions, one rotating clockwise and the other counterclockwise, producing a synchronized visual effect that is quite fascinating. It is worth noting, that upon startup the twin balances need approximately 10 minutes to become synchronous. And if the case receives a shock that affects the balances, it takes approximately two minutes to correct and become resonant again. Another interesting technical feature is that on the case band, at 2 o’clock, there is a button that resets the luminous twin seconds displays to zero, simultaneously resetting the twin balance wheels. Furthermore, both balance wheels oscillate at an unusual rate of 3.5Hz (25,200 vph). In addition to dual regulators, hand wound caliber ARF15 features dual mainsprings good for 48-hours of power reserve. 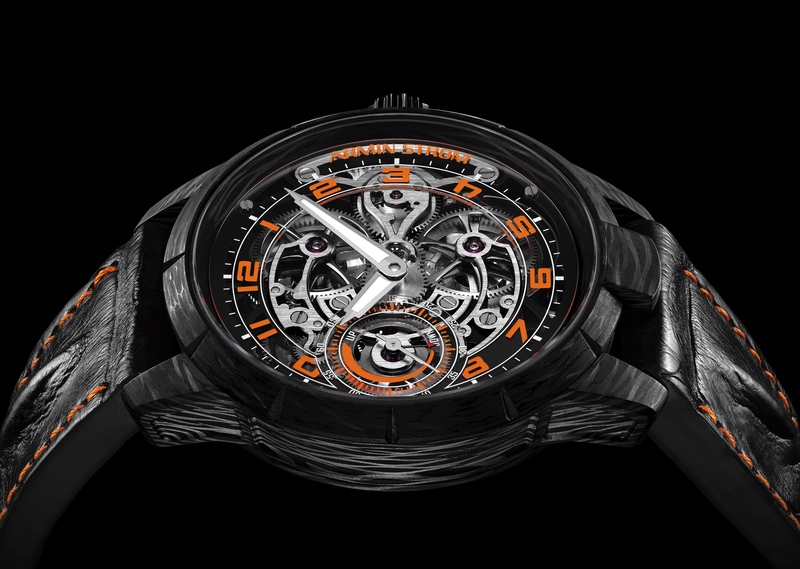 Armin Strom is a relatively small manufacture, based in Biel/Bienne, and this timepiece makes a significant statement. For those looking for a technically complicated timepiece, not available elsewhere, in a relatively small package, this is a competitive option. Tourbillons are cool, but this is so much cooler than most, and in theory, even more accurate.